Mystic Jungle welcomes Lepa. 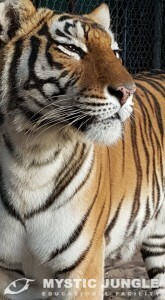 A 8 year old Malaysian tigress. Arriving with her lifetime companion, Bo, on February 21st, 2016, we are her fourth and final home. Tragically, Oko, the 18 year old Leopardess did not make it to the Jungle. She was lost during a surgical procedure for a severe wound sustained from a neighboring leopard at the third home of the cats. Lepa began her life easily enough. She was welcomed into the home of Steve Sipek (aka Tarzan) and Melanie Boynes. For four years she lived with Steve, Melanie and Bo. That was until Florida Fish and Wildlife Commission launched “Project Greystoke” . Sadly, as time progressed, laws changed. These laws were inclusive of banning private ownership of the big cats and new caging requirements. Although the FFWC had grandfathered Steve and Melanie in to keep the cats they were already in possession of, they could acquire no more and must improve the caging. To Steve, his caging was adequate as his house WAS the cage. The entire house was of marble and brass. But time had taken it’s toll on not only the man.. but the house. On February 27th, 2012, Florida Fish and Wildlife Commission swooped in, arresting Steve and later releasing him after the three cats were seized from his house. For almost 2 years the battle waged on in court to get Lepa, Bo and Oko back. During this time, they were held at a facility in central Florida. Finally, Steve and Melanie were awarded the cats back. The catch? Although not written nor spoken, neither would ever be able to obtain a FFWC Class I permit. No permit, no cats. Melanie and Steve then chose a facility close to their home. Fate was about to rear her ugly head as this is where they tragically lost Oko. As time moved forward, things began to change and personalities (human) began to become confrontational. It was then decided that the cats would be better suited in a different facility. Mystic Jungle was then asked to take Lepa and Bo. Lepa and Bo are now thriving at the Jungle. Arriving scared, confused and angry, they have returned to their former days of chuffing and greeting not only Melanie, Steve but me.